Is there anything more British than the Paddington stories? 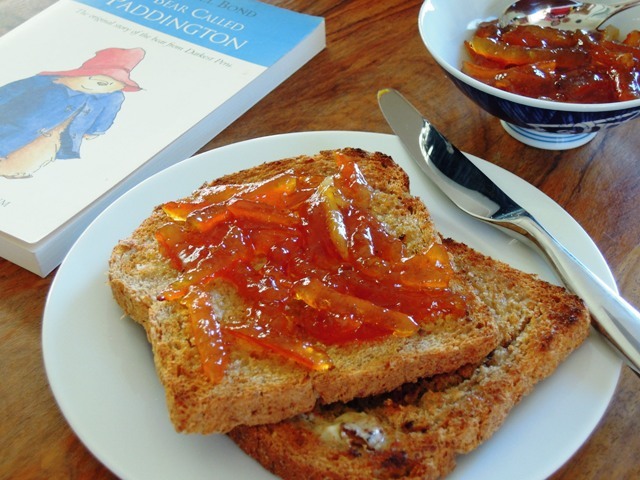 And is there anything more British than marmalade for breakfast? We are well into Seville orange season and everyone seems to be making marmalade, so I thought it was about time I had a go myself. I’ve made lots of jams and preserves but never for some reason got around to trying my hand at marmalade. I received a marmalade kit from Riverford, which contains organic Seville oranges and lemons, and a recipe card. You just add your own sugar and jars. And they said on the website there’s no need to have made marmalade before; the Riverford recipe is pretty foolproof and you can cook along with Guy Watson (Riverford founder) in their YouTube video. Perfect. Unfortunately the day I’d set aside to make marmalade I was absolutely full of cold and didn’t want to go anywhere near the kitchen. My husband Jason leaped to my aid and volunteered to make it instead. Result. Marmalade making is just the kind of thing he’s good at too. Any activity with lots of steps, where you need to follow detailed instructions and be a bit measured and scientific – that’s the sort of job he’s good at. And yes, our kitchen resembled a science laboratory while he was at it. And I can report that the final result was very good indeed. Perhaps the shredded peel was a little on the chunky side for my liking and he possibly boiled the marmalade a little too long, so it ended up rather dark, but a good first effort I’d say. Make sure your pan is big enough. If the pan is too full, the marmalade will boil over and with all that sugar it’s a complete nightmare to clean off your hob. When you dissolve the sugar, don’t do it too vigorously, otherwise it all sticks to the bottom and you’ll end up with burned marmalade which tastes hideous. Don’t boil the marmalade for too long. If you go beyond the setting point, your marmalade will set hard like concrete. And with some of that marmalade I plan to have a go at this gorgeous looking honey, ginger and marmalade cake recipe from Belleau Kitchen, as well as Riverford’s Seville orange marmalade pudding. 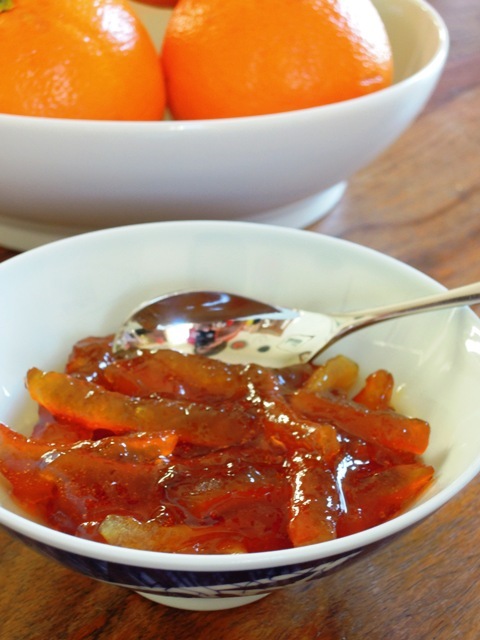 Do you have any other good recipes to share that use marmalade? Disclosure: Riverford provided me with a complimentary Seville Orange Marmalade Kit for this post. No money exchanged hands and all opinions are totally my own. 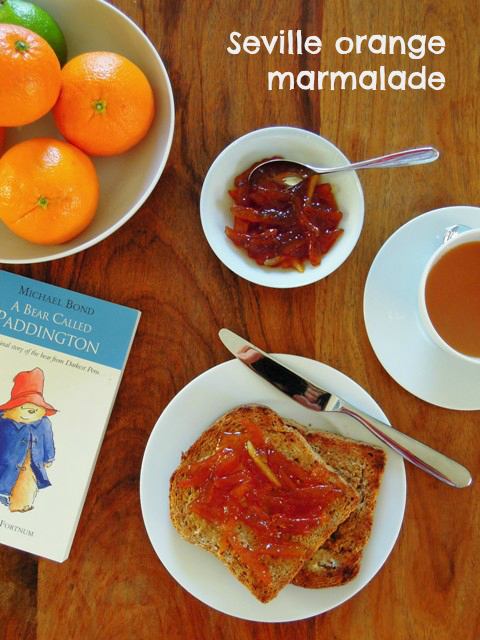 oh I love Paddington and that marmalade looks amazing! Thanks Deena! Although those were the two things I wasn’t sure about – thought it might be a bit dark and the peel cut too thick! The marmalade looks really good, well done to your husband for doing such a good job.